My Wandering Life: Lost in Translation. Again. Our conveniently located wet market where I would get all my fruit and veg for cheap closed down at the end of last year, leaving me trying out all sorts of other options for produce. Sadly, the stores that I can walk to within about a 6-10 block radius tend to be some of the most expensive for produce, stocking imported organic goods from America or Australia. Which, for some people, is fine. But for us it's out of reach for use on a regular basis. We've been doing a lot of potlucks and hosting lots of dinners at our house this summer, and it's been challenging to find economical options to feed a crowd. This Monday night we hosted our usual group, and I decided on doing a baked potato bar. Pretty simple, just bake up a bunch of potatoes (scrub, poke 6-7 times with a fork, rub with olive oil and coat with sea salt before baking on the oven rack for an hour at 180 Celsius) and then provide an array of toppings. I searched online for a grocery which sells russet, or at least large baking potatoes with a thicker skin, and found a site that seemed to fit the bill. They weren't russet potatoes, but Kerr's potatoes, which a quick google said were excellent for baking. So I pulled down the number button and clicked "20" because I figured 20 potatoes would feed a group of ten, and there wasn't a unit of measurement listed on the site. But late Sunday evening, several people in the group texted me to say they wanted to bring a friend, nearly doubling the expected size of our group. Always worried about having enough food, I realized that 20 potatoes wouldn't be enough, so I quick signed onto another online grocer who does same day delivery and ordered another 20 potatoes, at a higher price for the convenience. Monday morning at 9:00 a.m. my doorbell rang and I met the delivery guy at the door with my cash for the first order. He had an enormous cardboard box which he slid into my doorway. He went his merry way, and I went to lift the box and nearly threw out my back! The box weighed a ton! Confused, I grabbed a pair of scissors to open the box, only to find the entire thing stuffed with potatoes. I didn't order 20 potatoes. I ordered 20 kilograms of potatoes. If you're reading this in America, that is 44 pounds of spuds. An hour later the doorbell went off again, alerting me to my second delivery of the day, the other order of more expensive potatoes I'd placed when I thought I didn't have enough. In the end, I had almost 200 potatoes. When my non-English-speaking ayi (housekeeper) arrived, I did a brief interpretive dance to try and tell her what had happened, and she basically laughed her head off at me. At the end of the day she left thanking me though, because I sent her home with one full 10kg bag as seen above. The potato bar was a success. And very economical indeed because I didn't balk at the total cost of 44 pounds of potatoes! I'm sure next time I'll save even more money when I order a more appropriate amount. 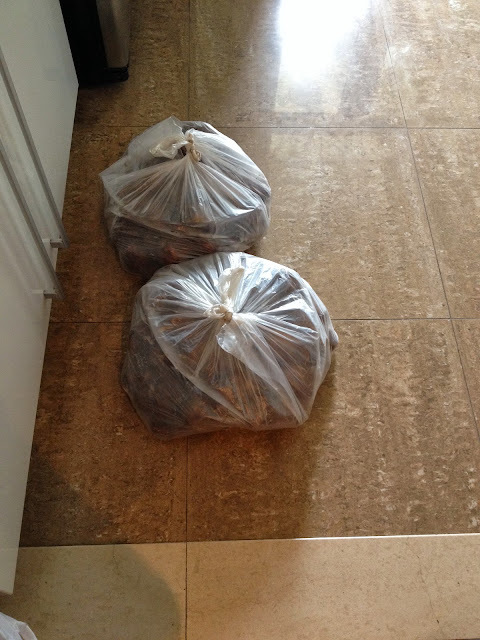 And we were good hosts too, as each of our guests got a parting gift of a small sack of potatoes to go. Despite the generosity, we still have about 40 potatoes. Right now we feel a little bit like Bubba in Forrest Gump when he was describing all the many ways you can eat shrimp. Only we're replacing the word shrimp with potato. Oh my! What a story! I could so see myself doing this.